Saying that the R16 was a milestone for Renault would be an understatement. Left without anything larger and more luxurious than its popular R4 and R8 since the Frégate’s departure, Renault was finally back in the family car’s segment. A state-of-the-art factory was built for the new R16 at Sandouville in Normandy, far away from the Billancourt main plant. Many innovations were incorporated into the R16, Renault claiming thousands of patents having been applied for its newest car. Above all, the R16 is often described as the first hatchback ever built. Oddly enough this enduring claim is the most dubious. It’s certain that the R16 popularized this type of body, thus being possibly the first hatchback of modern era. It was also the first hatchback in the family car segment. Due to its silhouette, it can also be called the first liftback ever without causing much controversy. Nonetheless the oldest hatchback’s title could be claimed by several other contenders, including the Citroën Traction Avant and the Kaiser Vagabond. No need to mention that Renault itself already had a car in its range that was a hatchback, though often considered an estate: the R4. But anyway, all these considerations perhaps come to naught when it is realized that the very name “hatchback” wasn’t coined yet, and wouldn’t be for several years more. A few days after New Year, 1965 the motoring press was invited to discover the new Renault. The least you can say is that it looked “different”. Its body featured rectangular headlights, a typical “beak” in the middle of its front grille, six side windows and, obviously, a rear door, adding practicality to the middle-range field, where up to then automobiles had been extremely conservative. The rear seats could be folded in order to create a spacious cargo area. The Renault 16 also distinguished itself by the high level of its equipment, a character it would retain throughout its life, introducing power windows in 1968, followed by an automatic gearbox in 1969 and central locking in 1973, all equipments that were virtually unknown at the time in a car of its price. Initially offered as a lone 1.5-litre saloon, the Renault 16 sold extremely well, in France above all, but also throughout Europe and even in the United States. I admit that I didn’t fully measure the R16’s success before I arrived in the Philippines in 1995, and found that this was still a rather common sight in Manila’s streets back then. The R16 was also much praised by the press, receiving the coveted European Car of the Year award in 1966. A few new variants appeared over the years though. First of all was the 1.6-litre “TS” at the 1968 Geneva motor show. Despite its modest increase in displacement, the engine’s output jumped from a leisurely 59 hp to a potent 83 hp, allowing a 160 kph top speed. Demonstrating that the R16’s success wasn’t only due to its bold design, Lotus selected the TS engine to power its Europa coupe, and it was also fitted to the Alpine A110. Later in October 1973, Renault introduced the 16 TX, a well-appointed variant. Easily distinguishable by its four square headlights and rectangular rear lights, the TX proposed a 5-speed gearbox, power windows, optional air conditioning, a rear wiper, a rear spoiler, and the elegant “Gordini” wheels from the sportiest R12 and R17. Despite this last element and a new 1647cc, 93 hp engine, the TX was conceived with comfort rather than performances in mind. From 1974, a black plastic grille replaced the original chromed piece throughout the range. In 1975, Renault introduced the R20/R30 range but, even though they carried over the R16’s concept, they proved unable to renew its success. As a consequence, the R16 was maintained in production while the R20 soon gave up its base 1.6-litre engine in order to limit the competition it gave to its senior. The 1978 R18, though smaller and more conventional, appeared as a worthier replacement to the R16, which finally retired in 1980, after more than 1.8 million had been built. 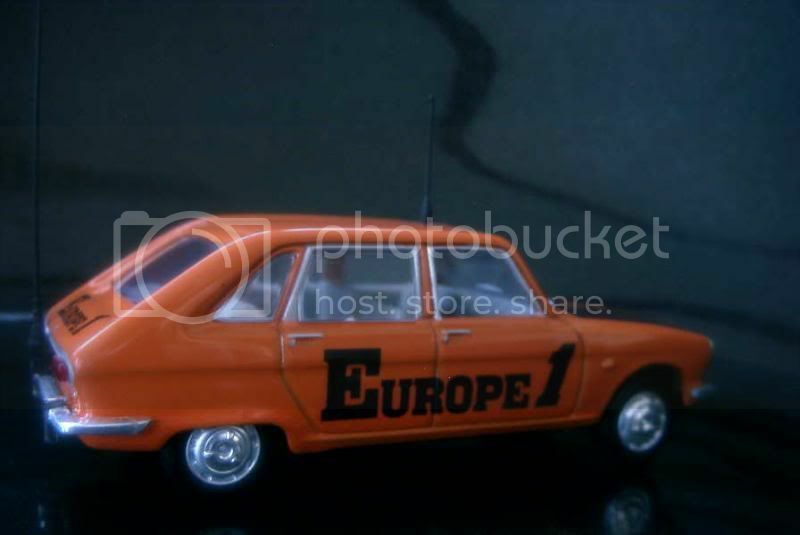 So, my only Renault 16 is this Tour de France press car (Europe 1 was and still is a major radio station in France). It is based on a model produced by Norev during the Nineties and discontinued years before Atlas released this collection. 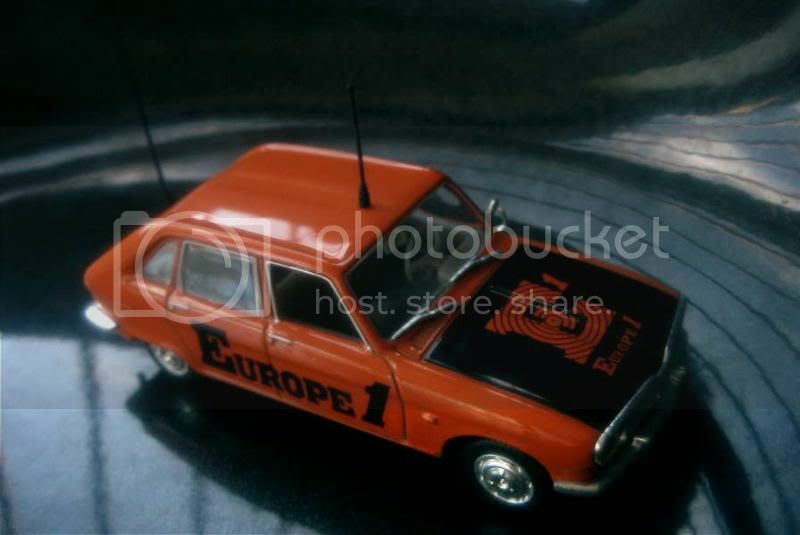 Also available were a “Radio Monte Carlo” car and a G7 taxi. This model is simple and reproduction is nothing more than correct: though the body is rather accurate, the passenger compartment suffers from its plastic-like appearance. My rating is 11/20. Your knowledge about auto industrial is incredible, you made my mind open widely. 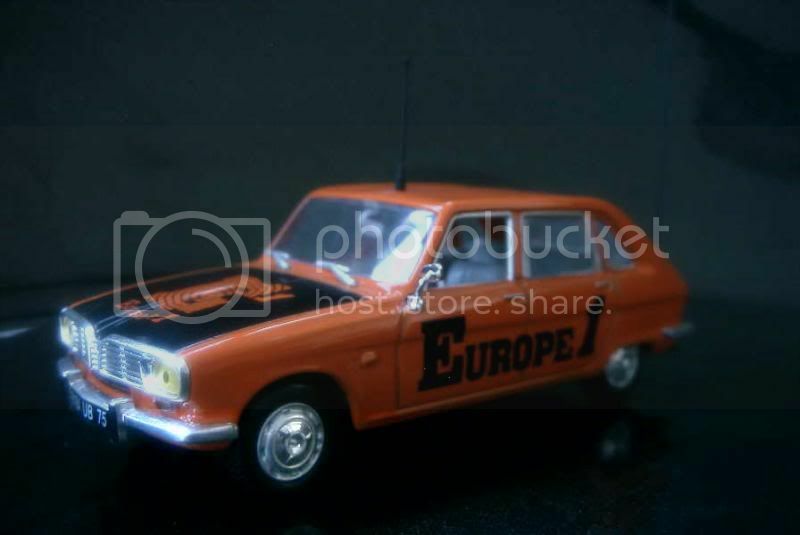 Actually, I like collecting classic Europe cars from 1950s to 1970s. They come with simple design but quite elegance and unique. You're too good Tom, when I see the knowledge displayed by some people on a few forums I really feel like I know nothing. Yes, cars from entire worlds, not from US, not from Japan. That's reason why I've collected VW Beetle and now addition to my collection are some classic cars of Matchbox and Hotwheels like Jaguar XK120SE, Citroen DS, Jaguar E Type, Mini Morris etc... Unfortunately, I cannot find other brands in Vietnam or European classic cars is not in the list of Sellers here.